As part of a generation of Australian women artists who came to the fore in the early 1980s, Anne Zahalka’s practice has always been concerned with questioning dominant myths and cultural constructs. The broad sweep of Zahalka’s oeuvre has often been underpinned by a common strategy: the world in her images appears as theatre where place, gender and national identity are questioned. In 1986 Zahalka undertook a residency at the Künstlerhaus in Berlin where she produced the series ‘Resemblance’. This group of eleven, highly orchestrated portraits of her contemporaries, quotes widely recognised conventions from 15th-17th century European painting. 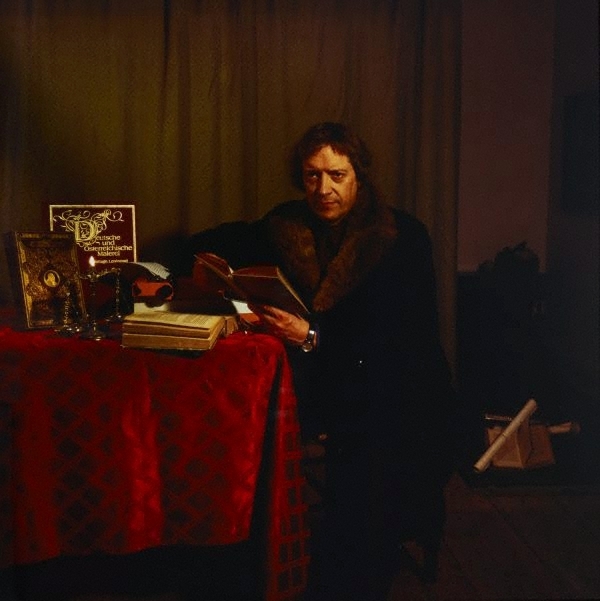 In ‘The writer…,’ the then director of the Künstlerhaus Bethanien is posed to resemble a 16th century European intellectual as though painted by Hans Holbein the Younger. As a portrait of a real person and a commentary on representation, the work alludes to the ease with which identities can be arranged and re-arranged. Unknown, Hall of mirrors: Anne Zahalka portraits 1987-2007 , 2007, (illus. ).